If there’s a measurement, two lines of “hits” emerge from the two slits, the signature of particles passing through. This puzzling fact has caused scientists to wonder, does the act of observation somehow “collapse” a wave (which is a set of possibilities) into definite entities — photons, electrons, or atoms, each going through just one of the slits? “Observation” has multiple meanings, however. It can refer to the experimenter’s consciousness, to the presence of a measuring device (with no experimenter right there), or to both the measuring device and an observing experimenter. 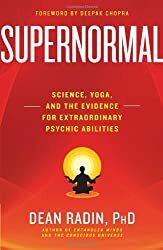 Dean Radin, chief scientist at the Institute of Noetic Sciences (IONS), wanted to find out if the mind alone could collapse the probability waves. So he set up a series of experiments involving thousands of subjects. No measuring devices at the slits, just people imagining the setup. Radin presented the findings at the Science of Consciousness Conference in Tuscon, Arizona, 2016. The recording below is long; 41 minutes. But it may be worth your time and attention. The consciousness of observers does seem to collapse the wave function. When research subjects imagined viewing the double-slit device with light aimed at it, the actual light tended to emerge as two definite lines rather than as a broad diffraction pattern. Distance made no difference. The subjects could be next to the apparatus or thousands of miles away. The effect was the same. This avenue of research is in its infancy. There’s much more to learn about how consciousness and physical reality interact. Controversy abounds. If the findings are confirmed and widely accepted, the impact could be great. Science and society may be enriched in unexpected ways. See Radin’s tweak to the current assumptions of science-based reality, in the second half of the video. Experienced meditators showed a much larger effect than non-meditators. Mental focus seems to be the activating factor. How can you benefit? Follow the evolving research, and in the meantime, focus on focusing! Related development: Radin and Roger Nelson conceived and founded the Global Consciousness Project, run by Nelson, which monitors correlations that may reflect the presence and action of consciousness on a planetary scale. This article also appears in Medium.